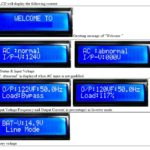 Optional LCD Monitoring Screen on 1-6KW Inverter Box - Shenzhen Sigineer Power CO.,LTD. This LCD Monitoring Screen can be prebuilt into Sigineer Power 1 to 6KW inverter charger box in factory. It’s not a standard feature, it comes as an optional part. This OPTIONAL LCD Monitoring Screen is optional on all Sigineer Power’s 1-6KW pure sine inverter chargers with a RJ45 LCD remote port. It draws as little as 0.5 watt to work.